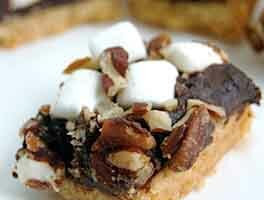 "Another favorite trick of mine to use with any mini cookie cutter. 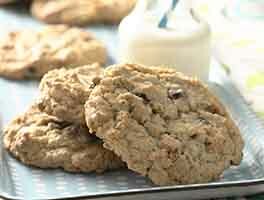 Bake a dozen each of 2 different types of cookies (ex. : sugar and snickerdoodle, or chocolate fudge). Then while they're still warm, cut the centers out and swap them out! As the cookies cool the pieces stick together and you get, for instance, a sugar cookie with a cinnamon heart in the center." What a fabulous idea! 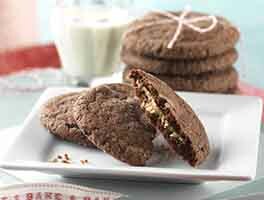 We were thinking sugar cookies and chocolate cookies would make a striking combination. But which recipes to use? They'd need to bake for the same time, at the same temperature, rise/spread the same, and make about the same number of cookies. We figured our Guaranteed Sugar Cookies would work just fine. But which chocolate cookie to pair them with? Serendipity! "John," a member of the Baking Circle, our online community, posted this recipe just as we started looking for the ideal chocolate cookie. As it turns out, John's recipe was a wonderful match: same baking time and temperature; same, size, shape, rise, and spread. The sugar cookie recipe makes about 8 more cookies than the chocolate cookie recipe, but who'd ever complain about a surfeit of sugar cookies? While it's somewhat of a project to make two batches of dough, then do the heart swap, we think the result is well worth the effort. Thanks, Angela and John! 10 mins. to 11 mins. 1 hrs 40 mins. to 2 hrs 51 mins. To make the chocolate cookies: Melt the chocolate with the butter, in a microwave oven or double boiler set over a burner. Set it aside. In a large bowl, mix together the sugars. Pour the chocolate/butter into the bowl, stirring to combine. Add the corn syrup, vanilla, egg, espresso powder, baking powder, baking soda, salt, and cocoa, stirring to combine. Stir in the flour; the dough will be soft and smooth. Cover it, and refrigerate for 1 to 2 hours, until it's solidified and stiffened up. While the chocolate dough is chilling, make the vanilla cookie dough. Lightly grease (or line with parchment) a couple of baking sheets. Preheat the oven to 375°F. Using a very slightly heaped tablespoon cookie scoop, drop six balls of vanilla cookie dough on one of the baking sheets, then six balls of chocolate cookie dough, spacing them evenly with about 2" between them. 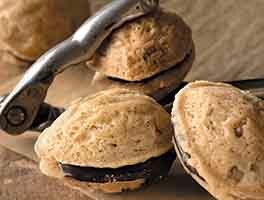 If you don't have a tablespoon cookie scoop, the dough balls should be a generous 1 1/4" in diameter. Gently flatten each ball of dough to about 2" across. Bake the cookies for 10 minutes. While they're baking, prepare your next sheet of cookies for the oven. Remove the cookies from the oven, and set your timer for 4 minutes. After 4 minutes, use a 1 3/4" to 2" heart-shaped cutter to cut a heart out of the center of each of the cookies. Quickly transfer the hearts to cookies of the opposite flavor, gently pressing them into the heart-shaped opening in the center of each. You'll now have vanilla cookies with chocolate hearts, and chocolate cookies with vanilla hearts. Change the look by putting the vanilla hearts bottom-side-up in the chocolate cookies; the bottom of the cookie will be medium-gold, rather than cream-colored. This yields more of a "heart of gold" look. For best stability, pop the cookies back into the oven for 5 minutes or so; this will help anchor the heart centers more firmly. Repeat with the remaining cookie dough. You'll have some leftover vanilla cookie dough, enough to make about 8 cookies. Cut hearts out of the center, and flip them over so the bottom's on the top: heart of gold! 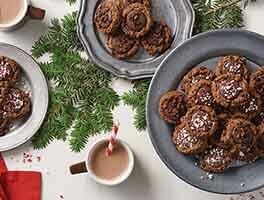 These cookies are best enjoyed within several days of making them. Wrap tightly, and store at room temperature. They're not good candidates for freezing, as the centers tend to loosen when frozen, then thawed. The sugar cookie recipe calls for cream cheese as an optional ingredient. Leave it out; it'll make the cookies puffier than the chocolate cookies, and it'll be harder to match the hearts. This is a winner but it took a day or two for me to realize that. A few cookies fell apart as I moved them from the cookie sheet so, of course, I had to "sample" them. They were just okay and, perhaps, a little bland. However, with a little time, the flavors really emerge. This is definitely a cookie to eat slowly and savor. The outside is crispy and the inner heart is soft and chewy. The two flavors complement each other nicely. The recipe makes 4+ dozen so there were plenty to share with others but still have enough left over for me and my Valentine to enjoy! Has anyone tried coloring half of the dough to make different colored cookies? Red for valentine's day, pastels for easter? This receives 5 stars with my procedure; otherwise 4.5. Both the recipes tasted delicious. The chocolate was a little crumblier & I had to add a little more cream (what I had on hand) to bring the dough together. I had to make one substitution for the chocolate dough- I used 1/2 dutch process cocoa & 1/2 black cocoa (didn't have double-dutch). Made these with my grandbaby for her mom for Valentine's Day. My procedure (no hot pans to deal with around little ones or worry of the hearts falling out after baked): I made both doughs, rolled them into 3" diameter logs, wrapped in plastic & refrigerated overnight. Next morning we cut 3/8" thick slices of each dough, placed flat, cut out the hearts, swapped them & baked as directed. They turned out beautifully! Didn't have any puff up around edges, they baked together nicely. The cookies disappeared quickly & the post office employees REALLY appreciated them. This is definitely a keeper. Thank you. A really clever idea and it worked just great. Everyone at the meeting where I took them really liked the idea especially for Valentine's Day, but we all agreed they are a little dull in taste. It's a great recipe. I baked the cookies for 8-10 minutes (my pan is really heavy.) When you work fast the do really well. 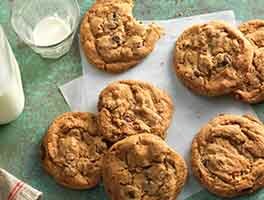 How about chocolate fudge and peanut butter for the two types of cookie?